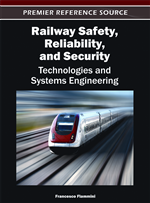 This book aims at presenting a set of novel and advanced techniques used in real-world industrial applications to improve the dependability of rail-based transportation systems. The analysis addresses both natural/random and intentional/deliberately-malicious threats (ranging from human errors, e.g. coding or maintenance mistakes, to terrorist attacks), which can compromise system integrity both at the hardware (control devices, infrastructures) and software (logic code, data network) levels.